The reputable agribusiness company PT. JAPFA Comfeed Indonesia Tbk through its subsidiary PT. Indojaya Agrinusa established Teaching Farm for Syiah Kuala University to be built in Gampong Ie Seu Um, Masjid Raya, Aceh Besar. 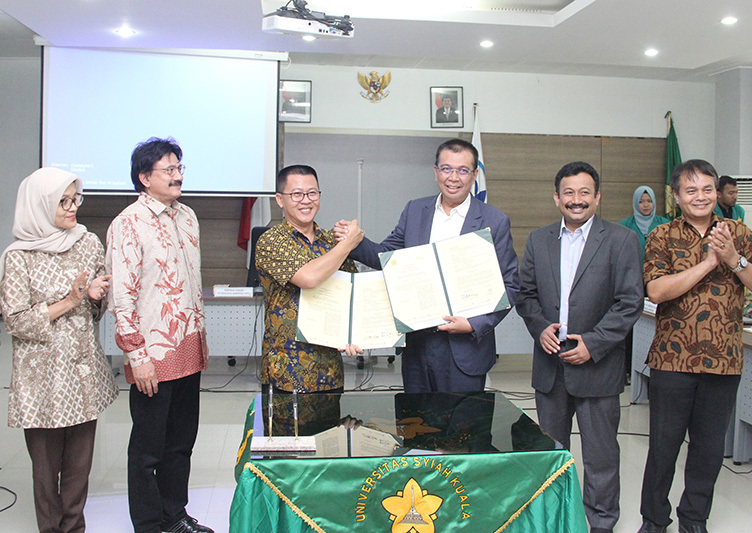 This commitment was realized through the signing of a memorandum of understanding by the Medan and Padang Operations Head of Feed, PT Indojaya Agrinusa Anwar Tadiono with the Chancellor Unsyiah Prof. Dr. Ir. Samsul Rizal, M.Eng in the Unsyiah senate hall. (Monday, 9/3). The Chancellor said, Unsyiah was very grateful for the JAPFA’s support in the effort to develop education and research at Unsyiah with the establishment of this Teaching Farm. According to the Chancellor, this greatly helped Unsyiah students especially those from the Faculty of Veterinary Medicine in conducting research. "Teaching Farm is very useful because it can be the learning space for Unsyiah students. Hopefully this can also support Unsyiah, which currently has a Public Service Agency (BLU) status, and in the next three years we are trying to become a legal entity, "said the Chancellor. Anwar explained that there are three types of cages to be built later. First, the Commercial Farm Closed House with a size of 12 x 75 meters with a capacity of 13,000. Both the Stage Commercial Farm Open House with a size of 8 x 75 meters with a capacity of 5,000 heads. And third, the Commercial Farm Open House Postal enclosure with a size of 8 x 75 meters with a capacity of 3,000. The total capacity of the entire enclosure reaches 21,000 thousand birds plus equipment and laboratory equipment and other cage support equipment. "Our goal is to build 3 different types of cages so that students can later study cultivation management, biosecurity and productivity from each cage," explained Rachmat. Teaching Farm will be built on land owned by Unsyiah outside the campus area. Anwar said that the teaching farm concept offered by JAPFA makes the cage a field laboratory for chicken cultivation, students will learn how to implement chicken breeding systems and patterns, find out the types of diseases and Bio Security in the cage. In each cycle of chicken cultivation, students are given the opportunity to conduct research at the location of the cage from various aspects. "We hope the presence of Teaching Farm can synchronize the qualifications of the poultry industry workforce with the learning process at the Faculty of Veterinary Medicine at Unsyiah," he said. On this occasion JAPFA also provided scholarship assistance to outstanding Unsyiah students, which were submitted by JAPFA Nutrition Ambassador Faoundation Maria Harfanti. Also attending the event was Vice Chancellor IV Unsyiah Dr. Hizir, Dean of the Unsyiah Faculty of Veterinary Medicine, the Deputy Dean of the Unsyiah environment. Head Commercial Farm Indojaya Agrinusa Taopik Robi, S. Pt. and Head of the Aceh Livestock Service.